It occurred to me the other day that sometimes I am stuck in the bad...not seeing or recognizing the good as often as I should. I allow myself to be filled with weight and worry and woes. I forget to remember the wonderful small, positive things that happen each week...a card in the mail, someone holding a store door or asking where I get my hair cut, a funny little story, or a ray of sunshine warming my face. 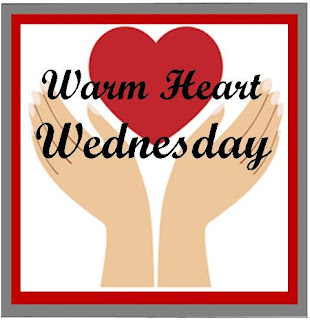 Warm Heart Wednesday is for me. To start remembering. And to make a journal of joy. I hope you will consider joining me on this adventure by sharing something that made YOUR heart warm over the past week. I think it will be fun and uplifting to read your ongoing journals as well. If you have any questions about Warm Heart Wednesday or problems doing your link just post it in a comment or send me an e-mail. I'll do my best to help you as quickly as I can. The McLinkey will be live from 1:00 pm MST time Wednesday afternoon.